University of Maine at Presque Isle officials are pleased to announce that the University’s Physical Therapist Assistant Program has received official status as an academic program after receiving full accreditation from the Commission on Accreditation in Physical Therapy Education [CAPTE]. CAPTE’s approval makes UMPI’s PTA program only the second Physical Therapist Assistant Program available in the State of Maine. The program’s initial accreditation is for a 5-year term, which is the best possible outcome for a newly accredited program. With this approval, the program will be able to graduate its charter class this month and help those students to register for the board exam in January 2014. The University began the two-year accreditation process in 2011, hiring Rolon to develop and lead the associate degree program. Since then, Rolon has worked with area hospitals to create partnerships with the program; collaborated with UMPI’s Athletic Training department and local physical therapy professionals on laying the program’s foundation in terms of policies, curriculum, and clinical site contracts; and Vanessa Patenaude has been hired to serve as a Professor and the program’s Academic Coordinator of Clinical Education. 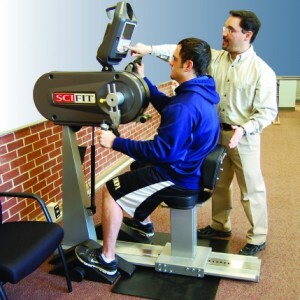 In addition to all these accomplishments, the PTA program has established a PTA Lab in Wieden that features the latest equipment to prepare students for the various physical therapy settings they will encounter in their professional careers. 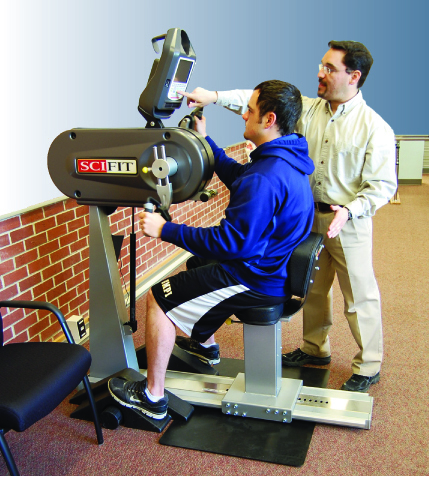 Located in the room to the south of the auditorium, the PTA Lab includes parallel bars; wheelchairs, crutches, canes, and walkers; therapeutic modalities including electrical muscle stimulators and ultrasound; exercise equipment including a pulley system, Upper Body Ergometer, weights, balls, and bands; and a smart projector system that responds to touch. The main PTA lab has treatment tables that can accommodate 14 students and there is a secondary lab for hospital environment simulations that boasts an electric hospital bed and a patient vital signs monitor for heart rate, blood pressure, and EKG. Right now, the PTA program has a class of 13 qualified students who are taking PTA courses this fall, with another class completing their general education requirements for application to the program next spring. To learn more about UMPI’s PTA program, please contact Rolon at 768-9542 or christopher.rolon@maine.edu.